What a wild and fun tablecloth, no?! 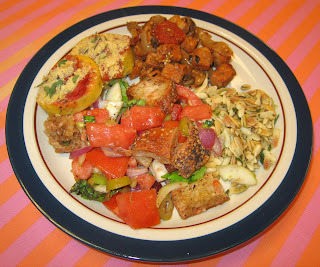 This was the first real week of cooking for my 6-week Ethnic Vegetarian Cooking class. I always ask and always seem to get a volunteer to bring in a tablecloth to enhance the dining experience. What a neat one we'll be using in this class! sponge-like in consistency, enhancing the taste and ability to pick up flavors. Because my wife, and sometimes I, suffer from digestion problems with tofu, I don't cook with it - with the only exception I can think of in my cooking classes. It was part of our main course eggplant saute.They also made a herbed orzo with lemon zest, a simple polenta side dish, starting with prepared polenta available in wrapped tubes, ... panzanella (bread salad) ... [and] blueberry crisp. The food was very good - these guys work well together in two teams. Everybody seemed to enjoy the meal! I wanted to finish up the Vizzino brand eggplant fillets that I described a few days ago, as well as start trying their artichokes. I made organic brown rice elbow pasta by Tinkyada (ricepasta.com) . I mixed in some Rising Moon Organics garlic-basil tomato sauce, along with the fillets, and topped with a little vegan Parm! "Parmesan cheese". It was very good! I liked the toughness of the eggplant and the subtle, hearty flavor it contributed. I also served a Field Roast Grain Meat Company apple-sage artisanal vegan sausage, heated on my cast iron pan with a little bit of oil from the Vizzino country-style chopped artichokes. Speaking of which, those artichokes were excellent!! I am going to go back to the store where I found them on clearance tomorrow and buy up their remaining supply, if I am lucky enough to find any left. 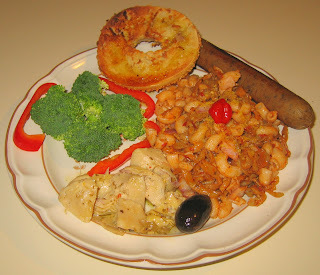 I also put a little of the oil from the artichokes onto a toasted garlic bagel half. My wife and I loved the meal! We had some tasty Thai curried vegetables leftover from our meal at Saigon Cafe from last weekend in Savannah, GA. Today's meal was simple and tasty. I heated the curried vegetables in a toaster oven and served over Thai rice noodles (that just needed to be briefly boiled). 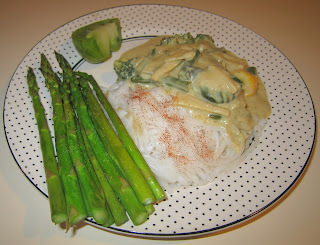 I cooked asparagus in a little bit of Floribbean Foods' Key Lime oil for a few minutes. And we enjoyed a little heirloom tomato. I didn't need to grocery shop today, but finished interviewing somebody (I am an alum interviewer for high school students applying to several universities that I attended) and briefly stopped by Whole Foods Market to get tofu. In this week's cooking class, we are using tofu, and it helps to freeze the water-packed (not the shelf-stable type) tofu then defrost it; it adds to the texture and helps the tofu to pick up additional flavor. Anyway, while I was there, I saw that they were selling a new item in their prepared foods area, portabella mushroom burgers. I picked two up. Yesterday at Trader Joe's, they were sampling these tasty sweet potato fries ("sweet potato frites") - the sampling convinced me, and I brought home a bag. 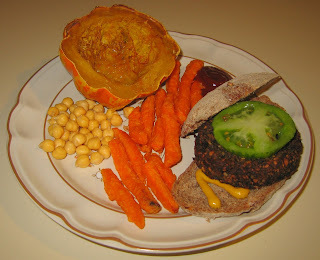 So, dinner tonight was a baked carnival squash, the frites, the burger on whole wheat bread with a slice of Green Zebra heirloom tomato and mustard, and chickpeas. I much preferred yesterday's meal but still today's was simple and pretty good! My wife and I were very pleased with today's dinner. 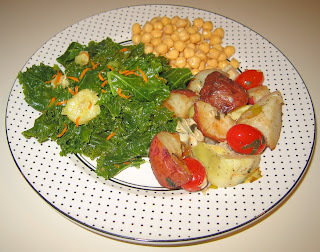 She has been in the mood for greens, so I thought that I would make a lacinato kale main dish inspired by the red kale one that I had made on January 3rd. Any kind of kale is of course very nutritious, but I found that my wife had some broccoli that needed to be used - another nutritional powerhouse. I put a little bit of olive oil into the bottom of a medium-large stock pot, and heated it over medium heat. Just a few moments later (since my pan was stainless steel, which heats up quickly), I added a medium shallot that I had cut into 1/4" strips and the crowns, with florets cut into quarters, of two stalks of broccoli. I let that cook for about two minutes, letting the broccoli get cooked and deeper in color. In the meantime, I sliced the kale just like I did last time; I laid the leaves out and just went down inch by inch, slicing across from tip to stem. I had leftover liquid from the green kale that I had cooked last week (my wife enjoyed drinking some of the leftover with the meal and remarked how tasty it was; I also served her some of the nutritious brew from tonight's meal). I added a cup and a half of it to the pan (but I later took note that a cup probably would have sufficed) and a little salt, along with the kale, and brought it to a boil. I reduced the heat and simmered, covered, for about 6-8 minutes. Then, I removed the cover and let the vegetables cook for another 7-9 minutes or so, till, well, it tasted right :-) ! While that was cooking, I roasted two ears of corn directly over the gas flame of my stove. I stripped the kernels from the cobs with a knife. I poured off the excess liquid from the pan, serving it to my wife to enjoy with the meal, then I mixed in the corn, a 2-ounce single serve packet of "Flame Roasted Green Chile Singles" from 505 Southwestern, and about 1/2 teaspoon of finely diced fresh ginger. I served it with some heirloom yellow tomato slices and guacamole. I also served what turned out to be a delicious and hearty open-faced sandwich. I was excited today when I stopped by at A Southern Season gourmet grocery store to find a number of fine Italian products, 6 ounce bottles tastefully decorated with a cloth cover on top, on clearance for 99 cents. They seem to be artisinally produced and imported from Italy; there is no website listed, but the company is Vizzino. I purchased a number of artichoke varieties (whole, roasted, "country style" pieces), as well as shredded bell peppers, and "eggplant fillets". These fillets (normally $6.59 but only .99 !) are 65% eggplant fillets (thinly sliced and, I think, raw), 33% extra-virgin olive oil, wine vinegar, chili pepper, garlic, "origan" (which the folks at the store said is marjoram, a close relative of oregano), mint, and salt. I put some lemon hummus on fresh lemon rosemary sourdough bread, then topped with fillets. We loved it, and all of dinner! Yesterday, we had an interesting potluck with a talk about cohousing. One of our members lives at the relatively new Pacifica cohousing community, where we met, and, after eating, she presented about cohousing and its tie-in (especially in terms of sustainability) to vegetarianism. We picked up a prepared vegan cherry pie and some guacamole for our contribution; it was a big turn out of about 35 people, and there was a lot of good all-vegan food! It's great to be cooking again! I have to get my kitchen restocked but my wife had some green kale in the refrigerator that I thought I would use. We were at an awards ceremony (a friend was given a grant for her artistry as a pupeteer and story-teller) and it was getting late, so we made a quick stop at Whole Foods Market. There, I found an intriguing combination in the prepared foods area, potato artichoke salad with lemon and leeks. Its ingredients are listed as potatoes, artichokes, leeks, tomatoes, canola oil, lemon juice and zest, and (unspecified) spices. I purchased it and served it after heating it, first separating out the tomatoes, over low heat in my toaster oven, adding the tomatoes in just for a few minutes at the end. It was good, and I will try to make a side dish like this in the future. For the main dish, simplified but somewhat inspired by an African kale and sweet potato dish that I made in January 2007, I tore the leaves coarsely off of the kale into roughly 1" squares. 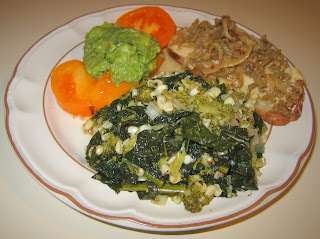 I sauteed the kale, as well as 3/4" chunks of a banana, in a little Floribbean Foods' Key Lime oil. While getting over my recent virus, I had a slight aversion to onions, and thought I would continue to avoid them today - I thought that the banana might build up a kind of texture that onion otherwise might have. That was about it, other than some salt and tangerine zest. I also served some chickpeas that my wife had soaked. It was a good dinner. I'm back! I can't believe that it took almost a month for me to get my appetite back. Thanks to all of you who sent your kind wishes. Last week, I was eating a little more than usual, but still mostly having soups, noodles, and other light fare. This weekend, my wife and I had a very nice visit to Savannah, Georgia. In addition to a beautifully restored historic town and being around many artists from SCAD, we loved spending time at The Sentient Bean, an all-vegetarian cafe with great vegan freshly baked sweetbreads and cookies. I still ate lightly at an Indian restaurant, Madras Saravana Bhavan, but by the time we left on Monday evening, I had a reasonably significant (and good!) meal at Saigon Restaurant, a good Thai and Vietnamese restaurant with many vegan choices (recommended!). I had another light dinner on Tuesday, but yesterday enjoyed going out after my last photography class to Panzanella; I think they make the best pizza in the area, but shied away from the pesto and had a simple pizza with roasted tomatoes and olives. It was clear my appetite was mostly back! Just in time - I have a new 6-week cooking class which began today (I taught photography last night, computer science this morning, and cooking tonight - what a melange!). I love to teach; one reason is that I meet very nice students, and tonight's new class was certainly no exception. After covering several presentations about the class mechanics and going over my Why Vegetarian? 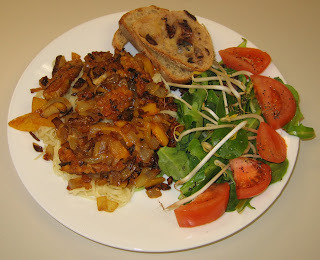 presentation, the students did a great job in about an hour preparing sauteed tempeh with shiitake mushrooms, bell peppers, and onions, and serving it with pasta, salad, and warmed bread. (I used to host a friend who would be away a lot and back in town only occasionally; sometimes she showed up at 3 a.m. Hospitality and genuine interest demands that one cook if our visitor hasn't eaten - what is one to cook at 3 a.m. for a visitor that is nutritious, yummy, and quick?) The food was great! I'm so happy to be getting my appetite back! I am excited about finally getting to treat my wife to proper evening treats, relieving her of leftover and light cooking she reluctantly was doing. By the way, back in early January, I mentioned that I had been interviewed by the editor of our local Independent newspaper for a story on vegetarianism. It turned out that they put together a nice cover story feature in the February 6 issue.